Ahead you will find the southern sun and warm sea. It only remains to gather to pack bags. And forward for new experiences and new forces. All this is true. 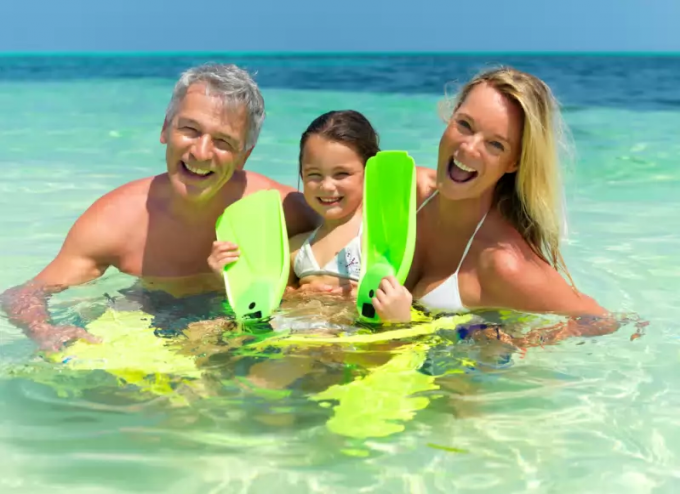 But if you are planning a family vacation with children, you have to be prepared mentally and financially to some of the possible points. Better to err and to be fully prepared than to regret the vacation not in the way you had planned. On the Russian beaches you can relax not worse than in Egypt and Turkey. Black and sea of Azov – a great place for families with children. Anapa and all its close coastal areas - Dzhemete, Vityazevo, Utrish is a real Paradise for the whole family. If your child is not even 5 years – then the best option would be to rest on the Azov sea with its shallow (not more than 50 cm) bottom in the first meters near the shore. This "frog" you should not worry for your baby. Choose pebble beach or sand, of course, the work of parents. But still, little children are happier to rest on the sand, where a more comfortable entry into the sea. In addition, on the sand you can lie and build the mysterious castles. Foreign families with children, too, should not be excluded. Resort hotels offer for parents and kids a whole range of facilities – playgrounds, services, babysitter, swimming pools for children, etc. Just think how your child will take flight. Many children are hard to tolerate new climate with all its components (temperature, humidity, composition of air and water, local food, bacteria, and viruses. Typically, the adaptation takes at least 7 to 10 days. Therefore with the child it makes sense to go on vacation for 3-4 weeks. Not worth it on the first day to succumb to the temptation to flee and to swim in the sea and basking in the sun. Give your child and yourself a little to get comfortable, relax after your journey. It is better to calmly walk, inspect the neighborhood and spend the first day of the chamber and calmly. No matter how delicious and exotic local food, try to feed your kids natural foods, especially the first 10 days. Local and exotic introduce gradually, carefully watching for children's health. Children's skin is more delicate and vulnerable than the skin of an adult. So burn your baby much earlier than you realized it about it. That did not happen, not happen with children in the sun, and especially water, from 11 am to 16 PM. Better to let your child sleep after lunch. Be sure to use protection from the sun. Do not sunbathe in the sun. Burnt place (if it happened) from oil Panthenol or sour cream. May you always be close to tent that you and your baby will be able to hide from the scorching rays. Ensure that the baby's head was covered with a baseball cap or hat. Take it to the beach and walk the pure water or mineral water. But from sweet drinks should be abandoned. After each bath be sure to wash children in the shower. Wash your hands yourself and your child before meals, do not allow to drink water from the tap or eat dirty vegetables and fruit. Make sure that the baby does not swallow sea water and did not touch the local animals. Always carry anti-bacterial wipes. Going on vacation with children on the sea be sure to assemble a Hiking first aid kit. It should be: green paint (better "Lekker"), iodine, hydrogen peroxide, antibacterial band-AIDS, bandages, cotton wool, paracetamol, activated carbon or other sorbent, "Linaks, ACC and nose drops, burn ointment.